Along with our 60 assisted living suites, we also provide the finest memory care Peoria AZ and the surrounding area has to offer. Nestled in the Arrowhead neighborhood of nearby Glendale, we have 25 secure suites devoted to the personalized care of those with Alzheimer’s and other dementia-related memory impairment. Our Reflections Neighborhood takes a holistic approach to dementia care that supports choice and independence and, above all, affirms individual dignity and value. Whether your loved one is just beginning the journey of dementia, or in the advanced stages, we stand ready to serve. At Arrowhead, memory care residents are able to move freely in a safe and secure environment, with full use of an enclosed courtyard reserved just for our Reflections Neighborhood. They are given daily health monitoring, 24-hour care and the expertise of a full-time licensed nurse. Our Executive Chef serves Reflections’ residents the same delicious, healthy meals as our assisted living residents. MorningStar’s resident-directed approach to memory care comes from a deep understanding of the disease. Our service plan is individualized for each resident based on background, preferences and abilities. Our specially-trained staff uses multi-sensory cues (including aromatherapy) to calm and to awaken memories and to support capabilities. Residents are invited to join recreational and meaningful activities, including music, life skills, art, entertainers and exercise, and to take part in outings and special events. Our suites are ready and waiting; all you need to bring are personal furnishings and mementos to make it feel even more like home. We encourage you to schedule a visit to experience firsthand the welcoming heart of our community. MorningStar at Arrowhead represents the finest in senior living with our unique mission statement “to honor, to serve, to invest.” Built on a foundation of honoring God, valuing all seniors and selecting staff with a felt calling to serve, we are privileged to create a home infused with warmth and love. 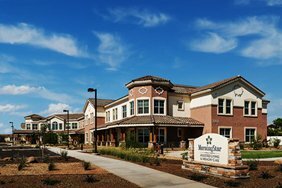 Schedule a tour to learn more about our individualized, resident-directed approach and the best memory care Peoria AZ and the surrounding area has to offer.